An owl awakened me in the middle of the night recently. Every syllable of its call was detailed and distinct as if it were only a few feet away from me. I resisted jumping out of bed to try and “see” it, and instead smiled, closed my eyes, and listened until sleep came again. When I awoke a few hours later, I reflected on the owl, its keenly watchful nature, its domain of night and dark. Many people are uncomfortable in the dark, in the dark night of the soul (as described by Saint John of the Cross and others), and in life’s “dark” places. Most everyone experiences these – grief, job change or loss, relocation, break-up, addiction, unknowing, etc. Although these “places” are difficult to navigate, they are necessary agents of change. Just as seeds need the dark, underground soil to break open and grow, humans also need the dark’s diverse nourishment. I’m opening to the possibility that wisdom wakes us to learn what’s in the dark. I’m learning to use my own light in the dark, and to companion others through it. Darkness is a unique place of transitioning and transformation. 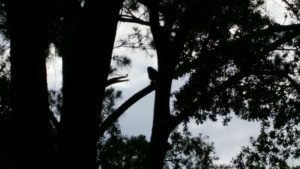 I saw the owl the next evening at dusk, sitting on a tree branch in the back yard. As I watched it, I mirrored its silence and stillness. “Ah,” I thought, “that’s wisdom.” Inevitably, the sky darkened, and night came on full. I realized that most darkness is rhythmic and necessary, and as ordinary as day easing into night. This entry was posted in Reflections on June 10, 2018 by Roger Sessions.